The National Institute of Mental Health reports that 2.7 percent of teens (both males and females) between the ages of 13-18 will struggle with an eating disorder. In my school that would calculate out to approximately 20 students, which is 20 students too many! It’s important to teach students what eating disorders are, what their characteristics are including the warning signs, why they occur and how to get help. 11.3.9 C Analyze the impact of food addictions and eating disorders on health. Have students read “The Day Off” and answer the questions that follow to get them to think about eating habits. Discuss their answers and lead them to the topic of eating disorders. Defined as…Eating disorders are a group of serious conditions in which you’re so preoccupied with food and weight that you can often focus on little else. The main types of eating disorders are anorexia nervosa, bulimia nervosa and compulsive eating disorder, known as binge eating or obesity. The YouTube clip about Eating Disorders and have students fill out the True or False statements while they watch it. Discuss and go over answers afterwards. The next day review the ABC Eating Disorders and go over specific information pertaining to each one along with some general information about eating disorders via the below PPT. Divide students into small groups, giving each group an envelope of characteristics. Students are to divide their mini-white boards into three sections and label A, B, C; one for each type of eating disorder. Students will then sort the characteristics into the correct eating disorder. Go over as a class to check answers. 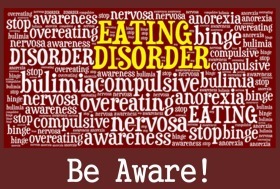 For the bell ringer activity the next day, I have students complete the ABC Eating Disorders activity for review. This could also be used for a quiz. Over the next couple of days students will complete the Picture Analysis Project on the laptops using all of the notes and information they’ve received about each of the eating disorders. See below guide sheet for more details. During National Eating Disorders week take a day and cover all the mirrors with paper and positive messages in your school to let your students know there is more to them than just what they see in the mirror.